Mon., Aug. 27, 2018, 8:45 a.m.
A cardboard cutout on display at the Ada County Republicans’ booth at the Western Idaho Fair this weekend earned harsh criticism online, prompting volunteers to take down the display within hours. The life-size poster depicts Donald Trump yelling as he holds former opponent Hillary Clinton in a headlock. It reportedly first appeared at the booth Friday evening. By Saturday afternoon, it was no longer on display but still located at the GOP fair booth. Anyone wanting to take a photo with the cutout could do so outside of the booth, said Anita Leatham, a precinct committeewoman who volunteered at the booth Sunday. Comments criticizing the cutout continued to pour in on social media Sunday. “I’m proud to have friends of all political stripes and I don’t believe the Republicans I know would support this. It really is beneath them and the party of Lincoln,” Lachiondo wrote. Sharon Ullman, the Republican nominee for a different commissioner seat, agreed. Ullman said she reached out “behind the scenes” on Friday night and Saturday to ask fellow Ada County Republicans to remove the display. 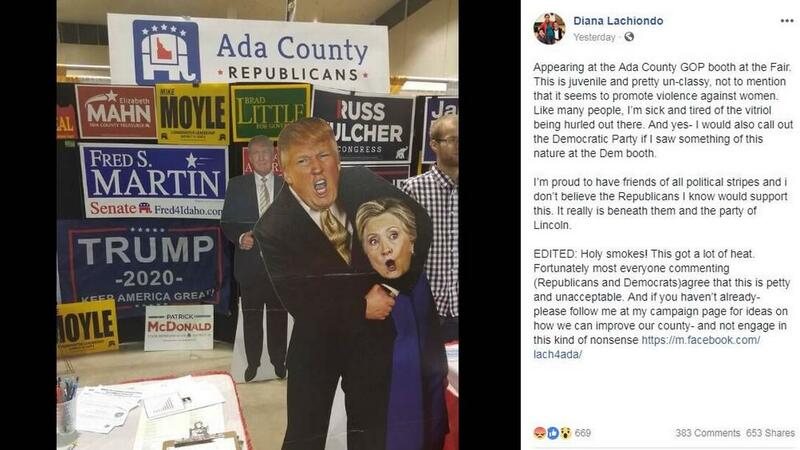 Photos of fair attendees with the cutout were deleted from the Ada County Republicans’ Facebook page, as well. Many of the commenters on Lachiondo’s post echoed Ullman – including other Idaho Republicans. Lachiondo said she worried how fairgoers would explain the “joke” to children. And further, she wondered, why rehash the 2016 election? Lachiondo said doing so is a disservice to voters who are concerned with local issues like growth and Idaho’s response to the opioid crisis. “(Voters) just don’t have time for this kind of nonsense,” she said. Ullman said she hoped the brief display and ensuing discussion didn’t leave a bad taste in voters’ mouths. “I would hope that this one decision (to display the cutout) doesn’t turn the public against our party, our candidates or our volunteers,” she said. It wasn’t clear Sunday who decided to erect the cutout, or later made the final call to take it down. Early that afternoon, it sat tucked away under a table in a cardboard envelope addressed to Ryan Davidson, chairman of the Ada County Republicans. Leatham said the cutout distracted from the Republicans’ goal of registering Idahoans to vote. Still, she said, in the 20 minutes she had spent at the booth, at least one person had asked to take a photo with it. A handful more had posed with another life-sized cutout of Trump still on display, smiling while holding two thumbs up. Published: Aug. 27, 2018, 8:45 a.m.